From D1 superclub Lansdowne Bhoys’ treble to F.C Ulqini’s historical "invicible" season in the Metro 1 Division to America F.C winning the Over-38 title in their debut season, CSL reporter Onz Chery rallies up all the CSL champions of the season. 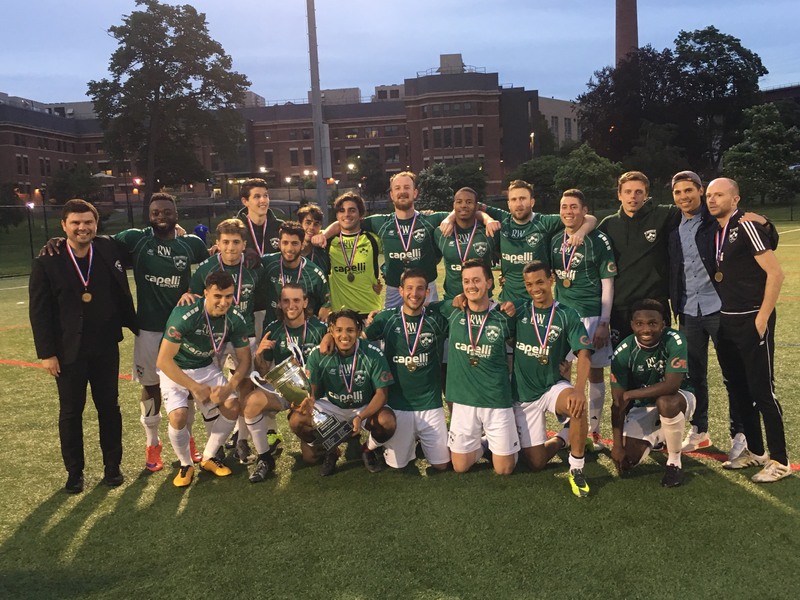 Lansdowne Bhoys re-captured their title of CSL champions after missing out on winning the league for four straight seasons last year, outlasting Cedar Stars Academy 4-2 in penalties after a 1-1 tie in the final. Cedar Stars were seconds away from winning the first division but Lansdowne forward Ovan Oakley drew a controversial last-minute penalty kick from Daniel Cordeiro’s shoulder to shoulder challenge. The Bhoys’ captain Sean Kelly converted the spot kick to send the game to PKs. Lansdowne got the best out of CSA in the shootout, 4-2, netting all of their four PKs through Kelly, Janos Lobe, Thomas Wharf and Michael Holzer respectively. The Irish team blanked NY Pancyprian Freedoms 3-0 in the semis, thanks to Oakley’s brace and Holzer’s long range hit. Oakley was selected as the second-best player of the season, tallying 14 goals in Lansdowne’s 20 league-games. NY Athletic Club Res. winning the D1 Reserve title is one the most compelling stories you will hear across the CSL this season. During the regular season the club rarely had their best XI on the field due to injuries and players’ prior commitment. However going into their last game of the season, NYAC Res. sat in the last playoff spot. Their last opponent of the regular season was the team that was looking to hop over them in the last playoff spot, Cedar Stars Academy Res. CSA Res. was unarguably the best team of the second half of the season, going into the match on an eight-game win streak. The Stars’ second unit needed to beat NY Athletic Res. by four goals to make the playoffs over them. NYAC Res. only had 10 players available and received a red card 10 minutes into the game. Hence with nine players, NYAC Res. had to prevent the most in-form team in the league from making the playoffs by holding them to at least a three-goal margin. They did it by the skin of their teeth. Cedar Stars Res. downed NYAC Res. 4-1. Things didn’t get easier for the Travers Island team in the playoffs as they had to face league toppers Lansdowne Bhoys Res. in the semis. The club was down 2-0 to the Bhoys but with the help of Gabe Bagot’s brace, they rallied back a 3-2 win. In the championship match, NYAC went down again to a hungry Central Park Rangers Res. side 1-0 going into the break. Jon Hemmert put NY Athletic Res. leveled midway into the second half from Bagot’s pass. Both teams went scoreless in the remainder of the match, sending the game to penalties. NYAC Res. converted all of their penalties and their keeper David McKeon racked one save to inspire the club to a 5-4 penalty kick win. NY Athletic Res. also won last year’s D1 Reserve title, edging Lansdowne’s in a 13-round penalty shootout. Hoboken F.C players and coaches posing for a picture with the Division 2 trophy. Hoboken F.C 1912 only loss one league-game, scored 76 goals in 17 matches—check the stats—while conceding 21. In the final, the New Jersey team had a comfortable 3-1 win over F.C Spring Valley, thanks to Cory Chaplin’s brace and Jeremy Whiterspoon’s solitary goal. Chaplin led the team in scoring, tallying 19 goals in 17 games. Hoboken Res. followed their first team’s footsteps, winning their division after rolling past Polonia Gwardia NY Res. 5-0. 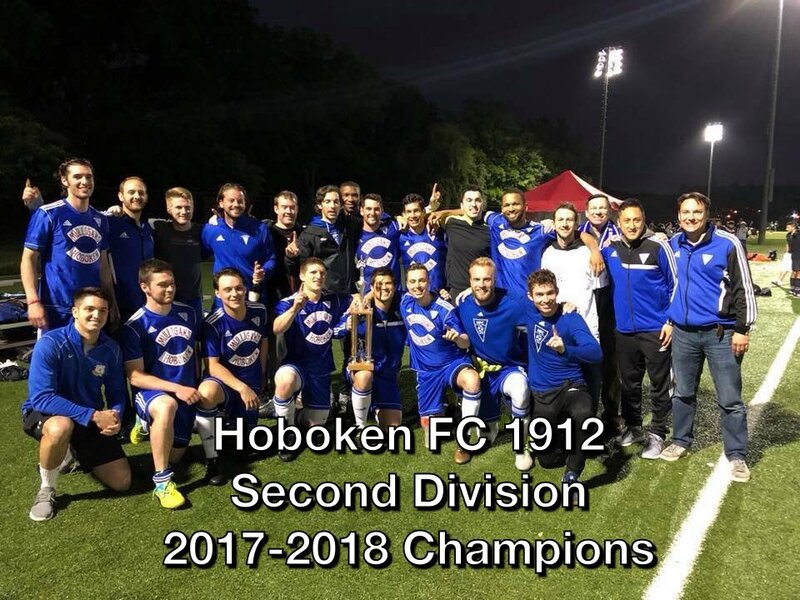 After their defeat over Polonia, Hoboken’s B-Team didn’t only become one of the 14 CSL teams to say they hoisted a trophy this season but also became one of the two teams that went undefeated in domestic action. Gleb Mironenko led the team in scoring, recording 14 goals, including one in the final. F.C Ulqini players and coaches posing for a team picture. 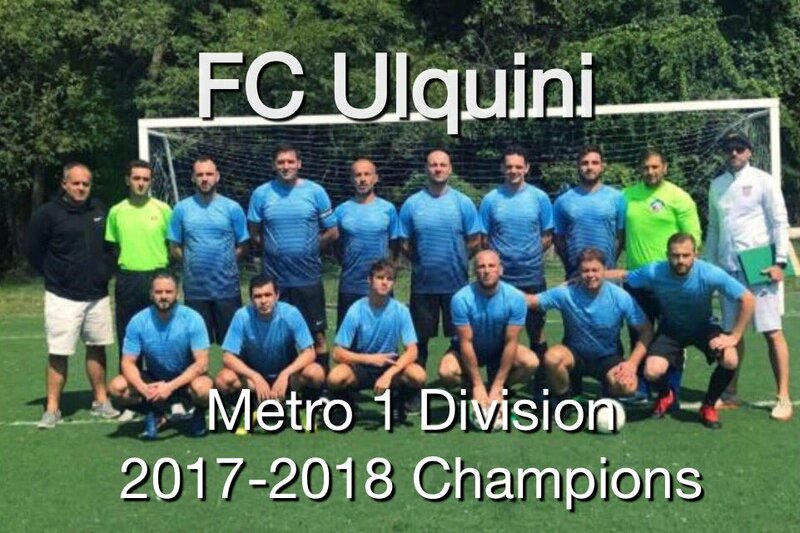 They call themselves The Invicibles and have their ID to prove it: F.C Ulqini finished the Metro 2 season on top of the league with a 17-0-0 record, while scoring a league best of 68 goals and conceding 12. The club also went undefeated in the Strumpf Cup. Right back Gledis Nuza was nominated as the team’s Player of the Season. Nuza netted over 15 goals and registered 10 assists. The club isn't afraid to say the 25-year-old is capable of playing in the MLS. 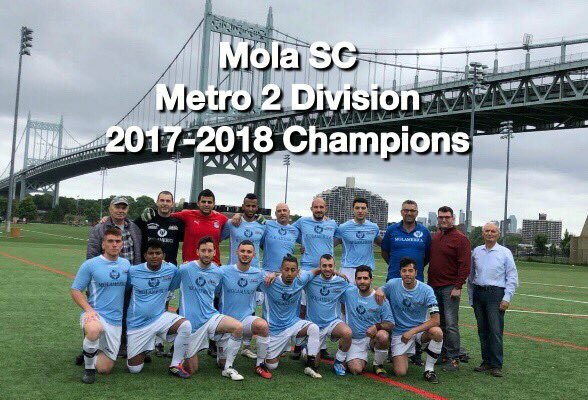 Molamerica SC won the Metro 2 Division for the first time since the 70s, thanks to Ahmed El-Ghareib’s spot kick save of the team’s 5-4 penalty kick shootout win over Flushing F.C in the final. Mola finished the regular season with a 14-3-1 record. Midfield anchor Kevin Brown was the club’s most valuable player. Last season, which was their first year of existence, NY Pancyprians O-30 habitually played with only nine, ten players and ended the season in fourth place. The club was able to constantly field a full starting XI this season. They showed what they’re made of. NY Pancyprians won the Over-30 title, powering past their rivals NY Greek Americans Res. 4-1 after going down a goal in the first five minutes of the final. The Freedoms O-30 is largely made up of the players that helped the first team win the CSL in 2010 and 2011 and qualify for the Lamar Hunt U.S Open Cup in 2008, 2010 and 2011. The Cypriot club’s top player of the season was Anastasios ‘Taso’ Polydefkis. Taso netted 26 goals and tallied eight assists in 11 appearances, including a brace in the semis and a goal in the final. Former Hoboken F.C players Norman Garcia, John Lopez and William Guarin founded America F.C in 2017 in honor of professional Colombian team America de Cali. Their goal was to win the Over-38 division in their first season. Mission accomplished. America won the Over-38 division, getting the best out of Doxa F.C Legends 6-2 in the final. NY Shamrock SC players and coaches posing for a team picture with the League Cup trophy. 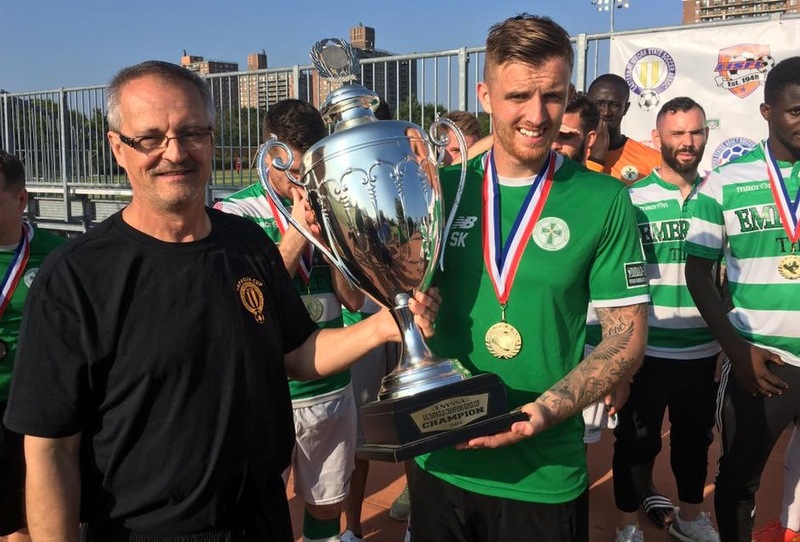 NY Shamrock SC hoisted their first League Cup in 18 years, beating reigning champions NY Athletic Club 3-1 in penalties after a 1-1 draw. Idy Watt netted the opener of the final but his goal was canceled by a NYAC header. Keeper Gianfranco Barone, who was only two when the Rocks last won the League Cup, guided the club to the trophy with two saves in the shootout. Lansdowne Bhoys players and coaches and board members posing for a team picture with the Manning State Cup trophy. Center back Thomas Wharf netted an 85th minute header to usher Lansdowne Bhoys to a 1-0 win over NY Greek American in the Manning State Cup final. Team president William McGregory was pleased the club won two major trophies after a rough campaign, in which they played their worst regular season in seven years, were knocked out of the Fritz Marth National Amateur Cup and the Werner Fricker Cup in the opening stage. Lansdowne also won the competition last year, blanking Shamrocks 3-0. Lansdowne Bhoys captain Sean Kelly receiving the Rapaglia Cup. It was all the way back in September but any silverware is worth mentioning. Lansdowne blanked NY Greeks 3-0 to win one-day tournament Rapaglia Cup for the second time. F.C Ulqini backed up their league title with the Strumpf Cup, overpowering Guyana Jaguars 4-2 in the final before outplaying BW Gottschee 3-0 in the semis. Ulqini went undefeated in their cup fixtures and domestic outings, which tallies up to 23 matches. The Albanian team is the only CSL club that didn’t lose a single game amongst the league’s 110 teams. NY Athletic Res. completed a double, winning their league and the D,Arpino Cup by defeating NY Greeks Re. 6-1. Brian Kuritzky and Ryan O'Donnell netted a double while Jimmy Peters and Chris Sutherland scored a goal each. Williamsburg International F.C players and coaches posing for a team picture with the Flamhaft Cup trophy. 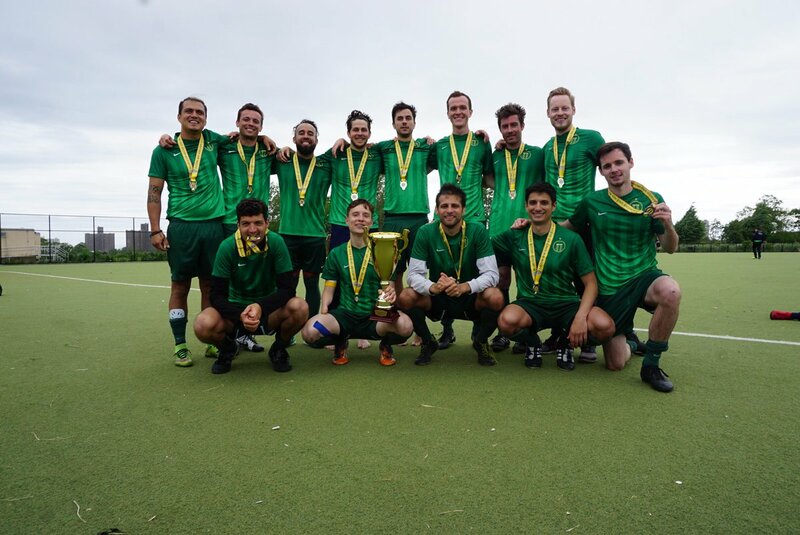 Williamsburg International F.C slimmed past Brishna F.C 5-4 in penalty kicks after a 3-3 draw to win the Flamhaft Cup for the first time in the club’s seven years of existence. Forward Chris Blivin stepped in the goal for the injured keepers in the semifinals and the final. Blivin only conceded one goal in the semis as the Doylies saw off NY Ukrainians 2-1 and saved Brishna’s last penalty kick of the shootout in the final to lead his club to the silverware. WIFC secretary Charles von Rosenburg views the Flamhaft Cup as the club’s most precious trophy. John Kaddo was Williamsburg’s top scorer of the tournament, racking five of the teams’ seven goals in their last three matches.